I convinced my DH to stop by a thrift store while we were in Nashville a week or so ago. I found this little settee and knew it had to go home with us! It needed a little updating and I thought the pack was a little plain but it had the making of a wonderful piece! Ready to go to Then & Again Home Marketplace to find a new home! 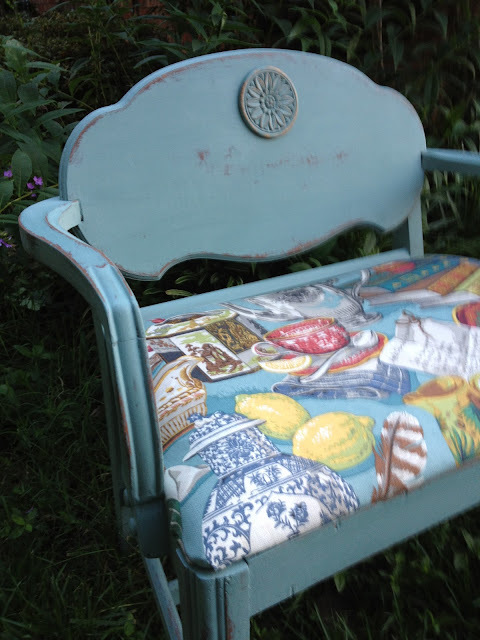 I added the medallion to the back to dress it up a bit, painted it with Annie Sloan Chalk Paint's Duck Egg, distressed it and recovered the seat with some cute fabric. What a fun piece to work on! Now on to the next one! Linking to some of my favorite blogs! !